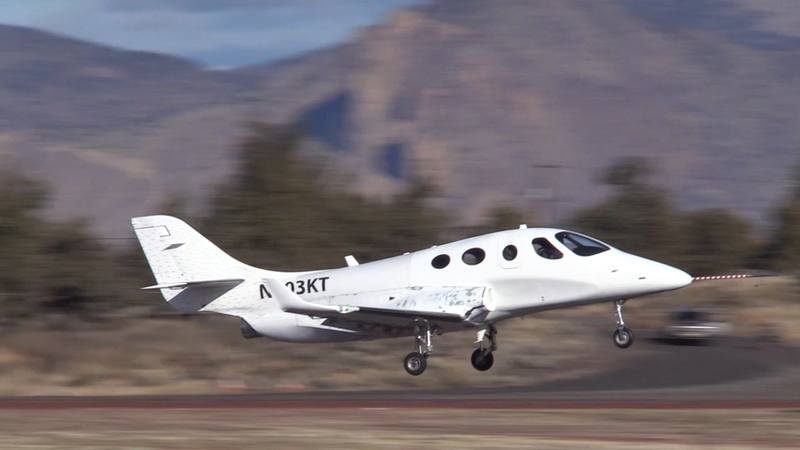 More than eight years after it was introduced, the four-seat Stratos 714 single-engine very light jet flew for the first time on November 21 from its base in Redmond, Ore., Stratos Aircraft announced today. During the 10-minute flight, the all-composite airplane reached a speed of 128 knots and an altitude of 3,700 feet with the flaps set at 24 degrees and the gear extended. Pilot Dave Morss was at the controls. Stratos plans to continue a “vigorous” flight-test program to expand the 714’s envelope to stated performance goals of 415 knots at 30,000 feet, 1,500-nm range and a 41,000-foot ceiling. When the aircraft was unveiled, plans called for it to be powered by a Williams FJ44-3AP turbofan; however, the test aircraft was equipped with a 2,900-pound-thrust Pratt & Whitney Canada JT15D-5. According to Stratos, with the Pratt engine the time to climb to 37,000 feet is expected to be 17 minutes. The company is not taking orders or deposits and is not providing a timetable for certification. However, Stratos said that interested parties could register on the company's website “for airplane availability updates and investment opportunities.” Stratos plans to reintroduce the aircraft at EAA AirVenture next year.